This Psychology Today blog post by Dr. Scott Barry Kaufman describes some research about power and creativity. Kaufman describes a new study by Daniel Sligte and his colleagues. The researchers assigned participants to work in pairs on a task. In each pair, one participant was assigned to a position of power, while the other played the role of subordinate. Moreover, the low power participants in each pair were assigned to one of two conditions: stable power or unstable power. By unstable, the researchers meant that the participants were told the power positions may be reversed at some future point. "For low power individuals, power instability is empowering, leading them to act and behave as high power individuals...Having unstable low power leads to feelings of confidence and self-efficacy, especially when low power individuals can gain power by being creative. They may be more confident about their abilities and also perceive that they have the 'power' to change their situation." The results imply that providing our employees with a clear path to greater responsibility and authority may actually empower them to be more creative in the here and now. We've always known that autonomy can be empowering and motivating. In some sense, this study suggests that the mere possibility of future autonomy can be motivating and may yield improvements in creativity. Beyond that, the study reinforces the notion that creativity is not simply a trait with which we are born (or not born). Creativity may be impacted substantially by organizational structure and environment. Socially, Roussanov says, aspiring entrepreneurs do not want to merely keep up with the proverbial Jones; they want to get marginally ahead of them. "Absolute wealth is not as important to them as relative wealth." Entrepreneurs also save more and spend less as a portion of their incomes than other people, according to Roussanov. The consumptive value of money isn't their motivation. Rather it's the social esteem that comes with achieving incrementally greater wealth than they had previously, and than their perceived peer group has. Of course, "Who 'the Jones' are changes as you progress," Roussanov points out. "First you think, 'I know these guys are successful and I would like to be like them.' But as you progress, you change your comparisons. You want to be in the Forbes 400, then in the top 10 and so forth." In his paper, Roussanov notes that "if the satisfaction brought by 'getting ahead of the Joneses' outweighs the danger of falling behind, risky activities with highly idiosyncratic payoffs, such as entrepreneurship, can be particularly attractive." By contrast, "Other people may not have this preference for status. They look at the risks and say, 'This is too much for me.'" Why did iPod win and Tivo lose? Apple also had iTunes, its proprietary software that let iPod users purchase and manage their music collections. iTunes was much more than this, however: It was pitched to music labels as a viable response to music piracy -- certainly much better than any solution the industry had come up with. This helped Apple win over not just consumers, but the providers of digital music. TiVo had no such allure to television programmers. Instead, its software made it a snap for people to skip ahead 30 seconds -- a little feature that scared TV executives into thinking the TV commercial was an endangered species. Few DVRs offered by cable companies allowed users to skip commercials without a complex reprogramming of their remotes. I think that I would add two points to elaborate on Kelleher's argument. First, Apple developed an entire ecosystem around the iPod platform, working with various partners. That encompassed not only iTunes, but also a whole range of accessories. Over time, more products emerged and built off of this ecosystem. Apple understood that providing attractive complementary products could drive iPod to the top. Second, the cable providers ultimately controlled the touch point with the consumer. They had the ability to push their DVRs to the home, since they were actually in the living room installing cable or upgrading people to high speed internet, digital cable, etc. Tivo did not have that distribution advantage. Apple, on the other hand, had many ways to touch consumers more directly, including its own stores. After all, Apple opened its first retail store roughly five months before the iPod came to market. News reports indicate that Saab may not survive much longer. Spkyer Cars bought the firm from General Motors when the American automaker went bankrupt. By the time of the sale, Saab already had been experiencing years of decline. In North America, Saab had a small following in the northeast, but little brand presence elsewhere in the country. Why will it be difficult for Saab to survive independently? First and foremost, the firm simply does not have enough scale. By most accounts, the minimum efficient scale (MES) for an automotive assembly plant is about 200,000 cars. MES is the point at which a firm has fully exploited scale economies. If a company operates below MES, its costs will be higher than more efficient competitors. Saab sold just over 30,000 automobiles last year - far below MES. It simply cannot remain cost competitive at these volumes. Of course, some automotive experts believe that firms must be much larger than MES to survive in the auto industry. They argue that the development costs for a new auto platform often exceed $1 billion, and thus, firms need to be substantially larger than the simple MES for an assembly plant in order to be cost competitive. Fiat CEO Marchionne has argued that auto firms must achieve scale of 6 million units to survive in the long term. I believe Marchionne may be overestimating the need for scale. The economics seem suggest that firms can be quite profitable at below 6 million units. For instance, Ford became very profitable the past two years, operating below 6 million units of production. Honda also has been a very profitable automaker despite not exceeding 6 million units. In the past, we have seen the drive for consolidation, based on a scale economy logic similar to that espoused by Marchionne. How did that work out? Well, the results of auto mergers and acquisitions in the 1990s look pretty ugly (think Daimler-Chrysler, Ford-Volvo, Ford-Jaguar, etc.). Apparently, consolidation isn't all that it's cracked up to be. For more on the risks of global mega-mergers, I highly recommend a classic article written several years ago by Pankaj Ghemawat, "The Dubious Logic of Global Mega-mergers." 1. Are we using technology to transform our business, or are we just adding bells and whistles to existing processes? 2. Are you ignoring important business differences as you standardize processes across the company? 3. Who is making sure the company's digital strategy is being implemented? 4. Is electronic data empowering your people or controlling them? Do Women Really Control Spending Decisions? For many years, the conventional wisdom has pronounced that women control 80% or more of the household spending decisions. Carl Bialik questions that statistic in this weekend's Wall Street Journal. He cites several interesting studies. For instance, Futures Co. of London published survey results indicating that only 37% of women responded that they have primary spending responsibility in their households. 85% of the women said that they had primary or shared responsibility for shopping decisions. Interestingly, 31% of men said that they had primary responsibility, and 84% indicated that they held primary or shared responsibility. In another study, by the Boston Consulting Group, women indicated, on average, that they controlled or influenced 73% of household spending. However, men in that same study reported they controlled or influenced 61% of household spending! Bottom line: Many consumer products and retail firms have relied on the conventional wisdom (the 80% rule of thumb) for decades. They ought to step back and consider what the data actually suggest about today's men and women. Moreover, they should evaluate how the real data might alter their marketing and retailing strategies. I've just finished reading Onward: How Starbucks Fought for its Life without Losing its Soul, by Starbucks CEO Howard Schultz. I recommend that you take a look at the book, if you are interested in hearing the details of the company's transformation over the past few years. Schultz explains how the firm had allowed the unrelenting pursuit of top-line growth to undermine its unique strategic positioning and competitive advantage. Then, he explains how the firm has tried to return to its premium coffee roots. The book provides a unique portrait of how and why a firm can fall so in love with growth that it can erode its brand and competitive position. I especially enjoyed the details regarding how Starbucks recast its vision and strategy, and then rolled that out to employees. That rollout process certainly was interesting and thought-provoking. While Schultz does take responsibility for some of the problems that occurred before his return as CEO, some might say he deserves even more blame. He pushed for incredibly rapid growth in multiple directions and did not recognize the dangers for quite some time. To his credit, he finally admitted the flaws in the strategy when the numbers began to decline. He didn't just blame the problems on the recession, but instead, he took a fresh look at everything the firm did. Schultz made a number of moves to improve Starbucks' products and service. The book does leave some questions though. Has Starbucks completely learned the lessons of the past? While many of the recent moves have indicated a shift back to the core premium coffee roots of the firm, other moves seem similar to past drives for top-line growth above all else. Schultz clearly finds himself walking an interesting tight rope, trying to "recapture the firm's soul" while still pursuing growth. Does Open Table Help Restaurants? "OpenTable's high fees in the restaurant industry's world of slim margins only raise the stakes in the debate. "When I look at other IT systems in my restaurant -- my point-of-sale system, my telephone system -- those take up about 0.1% of my annual revenue," says Mark Pastore. His blog post explaining why he doesn't use OpenTable at Incanto, his San Francisco Italian spot famous for its offal-heavy menu, kicked off an industrywide debate late last year. "OpenTable is going to cost me at least 2% to 3% of revenue." Many restaurants make less than 2% in pretax profits. OpenTable, Pastore says, is eating away at many restaurants' only income." I think the question is not simply whether Open Table increases restaurant revenue or not. One also has to look at the cost side. Do the restaurants save money by using Open Table? The article points out that some restaurants believe that they save labor costs, because fewer reservations require a conversation with a staff member. Other costs may come down as well though. For instance, perhaps the use of Open Table, coupled with smart use of other social media and web technologies, can reduce marketing expenditures for some restaurants. If so, then the costs may exceed the benefits. Still, the article raises a very interesting question: Do intermediaries always facilitate transactions in a way that is beneficial to both parties, or might the costs they impose actually exceed the benefits for the seller in some circumstances? Professors Paul M. Leonardi and Elizabeth M. Gerber of Northwestern and Professor Tsedal B. Neeley of Harvard Business School have published an interesting new study in Organization Science. They have found that managers who send a series of redundant messages to team members using multiple media achieve better results. They can actually get projects accomplished more quickly than those who do not use persistent and redundant communication. The paper is titled "How Managers Use Multiple Media: Discrepant Events, Power, and Timing in Redundant Communication." The authors also found that those managers with less power and formal authority tended to use this strategy of persistence and redundancy more often. Neeley explained to the HBS Working Knowledge blog: "Those without power were much more strategic, much more thoughtful about greasing the wheel to get buy-in and to reinforce the urgency of the previous communication. Managers without authority enroll others to make sense of an issue together and go for a solution." The Wall Street Journal's Heard on the Street column focuses on Hasbro today. It lauds the firm for not simply relying on licensed content from movie studios to sell toys. Instead the firm has turned some of it's own toy properties into movies. In that way, the firm has driven toy sales without having to share profit with someone else who owns the intellectual property. Rightfully, though, the column questions whether Hasbro has chosen the best properties to make into movies and whether they can continue to sustain this early success. Hasbro has done a great job and does have many interesting properties in the portfolio. There is a lesson here for all firms though. Investors will build early blockbuster hits into their expectations. One has to manage those expectations carefully, because it may be hard to sustain that performance. Iwan Barankay, a management professor at Wharton, has conducted a new study titled, "Rankings and Social Tournaments: Evidence from a Field Experiment." "Many managers think that giving workers feedback about their performance relative to their peers inspires them to become more competitive -- to work harder to catch up, or excel even more. But in fact, the opposite happens. Workers can become complacent and de-motivated. People who rank highly think, 'I am already number one, so why try harder?' And people who are far behind can become depressed about their work and give up." Granted, this study cannot be used to generalize across all organizational settings, and note that it involves rankings that are not attached to bonus compensation. It represents one study in a particular context. However, it does raise some key questions that managers must consider when they chose to compare employee performance against peers. I learned about a neat practice at Boeing today. The aerospace giant leverages the knowledge and expertise of retired engineers and managers in a creative way. The firm brings them back in to evaluate progress in key projects. At times they serve as a constructive devil's advocate - that unbiased expert who can provide a fresh perspective on a project. The technique also helps prevent the sunk cost trap too, I believe. All firms need to use unbiased experts who don't have vested interests to apply a second set of eyes at times. Using retired experts is terrific, as they know the business and the culture. 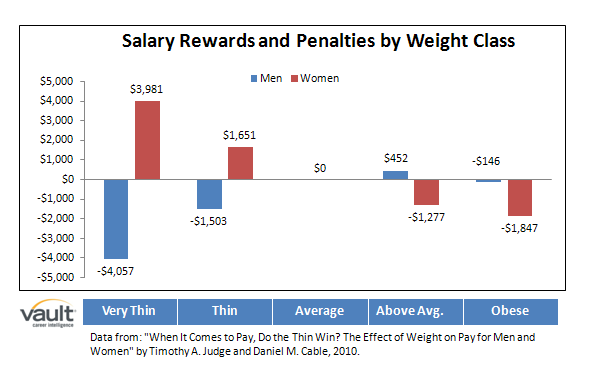 "In the Judge and Cable study comparing females' salaries and their respective weights, the greatest salary benefits for women occurred at two standard deviations below the average weight (the "very thin" category)—rewarded with an average of $3,980.88 increase in salary. But that "very thin" ideal only seems to apply to women. For males, the most-prized body type was "chunky and muscular," and men could gain much more weight—right up to the obesity range—before losing any money. On the other hand, there was a pronounced intolerance for a "skinny" appearance in men—costing those in the very thin range about $4,056.67." What's interesting about these three winners? Each of these concepts involves a healthy dose of customization for the consumer. I believe that every brick and mortar retail needs to be innovating in the area of customization if they are to survive. I've been stressing that on this blog for some time, and these award winners only reinforce my belief. Congratulations to the winners! Todd Wasserman has an article at Mashable today about Swedish telecom company 3 Sweden's new online store. The firm has added live salespeople to it's online store using video and touchscreen technology. I'm curious to see the results. If the experiment proves successful, we could see a few more gray hairs for the leaders of traditional brick and mortar retailers. E-commerce will have found a way to bridge the experience gap relative to retail locations. I'm surprised actually that many ecommerce sites haven't taken more advantage of video technology. This step could trigger many more interesting experiments. Why don't more senior executives call the managers in their ranks when those managers engage in silo thinking? That question has puzzled me for some time. I think there are three reasons. First, some people shy away from the notion of calling a colleague selfish - they are simply too conflict averse to do it. Second, they worry about reciprocity. Will that manager call senior executives out for their own silo thinking? Third, some executives believe that some element of competition among various units is productive, but they have a hard time balancing the desire for competition with the need for collaboration. 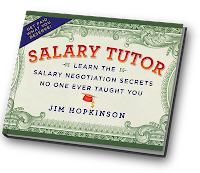 Jim Hopkinson, a Marketing Director at Wired.com, has written an interesting new book called Salary Tutor. 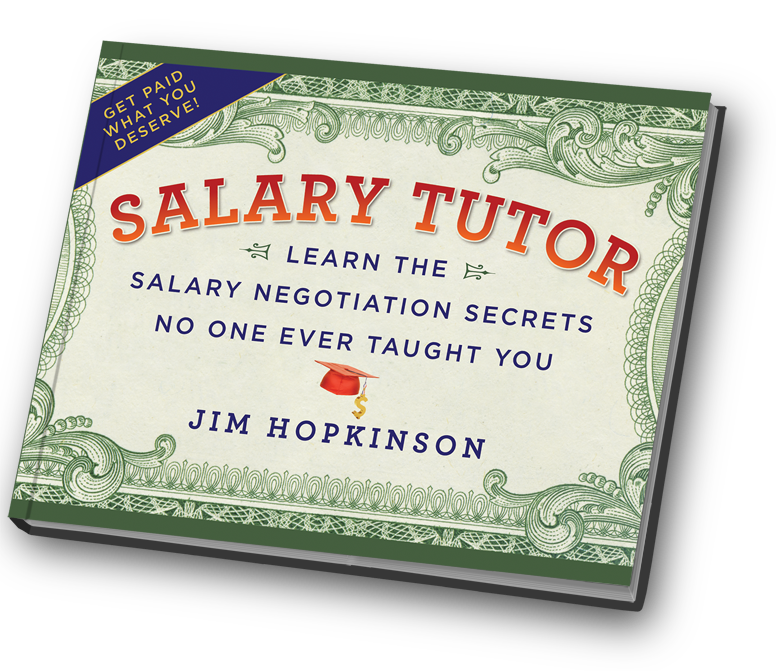 The book offers some fantastic advice on salary negotiations. The book offers plenty of practical tips and lots of examples. Some of you may know Jim from his popular blog, The Hopkinson Report, on which he posts interesting podcasts regarding media marketing trends. I believe Buffett has a duty, given his stature and influence, to speak openly about this situation. He has to talk about the ethics of this behavior, and he has to discuss the lack of proper controls at Berkshire that allowed this to occur. He has to admit he made a big mistake not probing further when Sokol told him that he owned shares in the target firm. I believe that he also should tell us if he essentially fired Sokol for this behavior. Buffett loves to share his views on a wide of topics. He loves wielding widespread influence. That's fine, but with that influence comes responsibility too. Many people admire Buffett and look up to him, including droves of young business students. Mr. Buffett, these young people are watching and listening. The ball is in your court.